Thursday at 10AM, it's The Governor's Monthly News Conference, a live, unedited exchange between Utah reporters and Governor Gary Herbert. Medical marijuana laws will likely remain a “work in progress” for years, Utah Gov. Gary Herbert said Thursday, despite a proposed state-run cannabis program expected to be taken up by lawmakers next month. That’s because the federal government continues to classify cannabis as a Schedule 1 narcotic, Herbert said, which impedes progress on a drug that many believe can alleviate pain and suffering. During his monthly televised news conference on KUED, Herbert reiterated that he intends to convene a special session of the Legislature in November to debate medical marijuana. The session will follow either passage or failure of Proposition 2 — a ballot initiative that would legalize marijuana use by qualifying patients — and will focus on a medical marijuana framework negotiated by legislative leaders and both supporters and opponents of the initiative. While many states have already legalized medical marijuana, Herbert said no model program yet exists in the United States due to issues like the cash-centric financing of cannabis cultivation and distribution, and the insufficiency of research regarding dosage levels and side effects. As with medical marijuana, Herbert suggested ongoing work will be needed regarding Medicaid, whether or not voters approve a ballot initiative to fully expand the program. The program already accounts for roughly 19 percent of the state’s budget, Herbert said, and that percentage is likely to grow if Utahns approve Proposition 3′s plan to extend health care coverage to roughly 150,000 low-income Utahns. “The fiscal aspects to this are something we need to take a look at,” Herbert said. 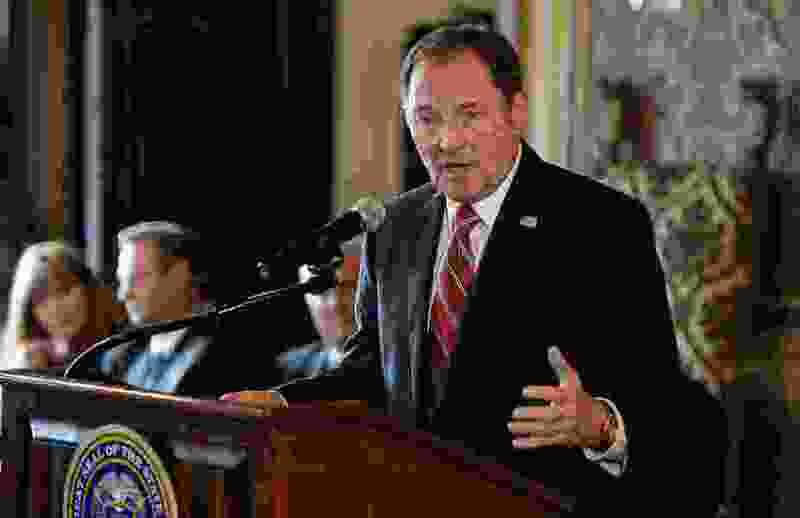 After the passage of the Affordable Care Act, or Obamacare, Herbert proposed a Medicaid expansion plan known as “Healthy Utah” that was rejected by lawmakers. He said Thursday that state leaders will continue to work on solutions for low-income Utahns, whether that be adjustments to Proposition 3 if it passes or state-led efforts if the initiative fails. Herbert was asked about the migrant caravan making its way to the United States' southern border that has become a divisive controversy in the lead-up to next month’s midterm elections. He said Utah always has been compassionate on the issue of immigration and the state’s leaders more welcoming to refugees and immigrants than many of their peers around the country. “We also understand and uphold the rule of law,” he said. The governor said he understands why people want to come to the United States, adding that “there is no better place in the world.” And he repeated his disappointment toward the federal government for failing to take action and address the obstacles that exacerbate illegal entry into the nation. Herbert has publicly opposed a constitutional amendment that would allow Utah’s Legislature to call itself into special session — a power reserved for the state’s governor. But on Thursday, he confirmed that either his political action committee or other groups he’s affiliated with plan to contribute to an anti-amendment campaign organized by Marty Carpenter, Herbert’s former campaign manager. “I support the status quo,” he said, explaining his objections to Constitutional Amendment C.
The amendment, which voters will either approve or reject next month, stems from a disagreement last year between lawmakers and the governor over how to fill the state’s congressional vacancy after the resignation of Jason Chaffetz.